Ever wanted to know what it was like to dine like royalty? Then Cinderella's Royal Table is the place for you. 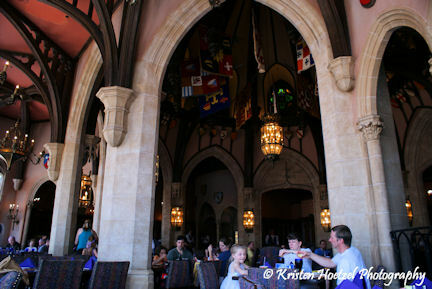 With stain-glass window, family crests and beautiful chandeliers you'll feel like your eating inside a medieval castle fit for a princess or prince. Enjoy the amazing view of the Magic Kingdom park for one of the tables overlooking The Hub and Plaza Rose Garden. A must do for your little princess!